As ever, scholarship moves on. In his book on Dufay, David Fallows (Master Musicians, 1987 edition) writes that it’s possible that both of these masses were written for Duke Louis’ Savoy Chapel but that the mass based “on ‘L’homme armé’ could well be later” (page 194). It can’t be denied that what marks them off as rare is that they are both based on popular songs of the time rather than the usual seasonal plainchant. In view of this a date in the 1450s and the Court chapel of Savoy - where Dufay worked - as a context seem probable. In fact apart from the rather dubious claims of the Missa ‘Puisque je vis’ all other Masses by Dufay are plainchant-based. Dufay had written the chanson ‘Se la face ay pale’ in the early 1430s, before his sojourn in the papal chapel. It was an early success story for him. The ‘L’homme Armé’ tune, used by at least a dozen composers, is anonymous, monophonic and possibly a folk tune. Who might have inspired it remains an unknown. The argument for putting the masses together as a pair runs as follows. A relic, a cloth (known as a ‘Veronica’) which induced much fervour had a ‘pale’ image of Christ’s face imprinted on it. It was in the Savoy chapel after 1452, according to the fascinating booklet notes by Giuseppe Maletto who directs the group Cantica Symphonia and Guido Magnano (who plays the organetto) and was much venerated. They write, “Surely Louis would have wanted to highlight the Shroud ceremonially”. 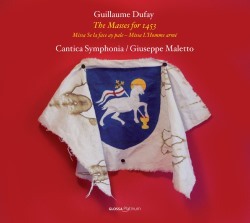 He hurriedly called Dufay back to Savoy in 1452 and “we may surmise, asked the composer to provide him with a musical work with which to honour the relic”. The style of the work is one of serenity, elegance and balance. The ‘L’homme armé’ mass is more outgoing and, it seems, had a completely opposite purpose, focusing on Christ the warrior. The western world was outraged when in May 1453 Constantinople fell to the Turks and action was needed to redeem the situation, action that never actually came to fruition. Was the mass written in response to this call? Oddly enough however the booklet writers who have stated their, I feel, quite logical case for the 1453 dating, introduce the mass by writing that it was “written in the late 1450s or early 1460s”. These are dates which Fallows seems to support when he comments that Charles the Bold of Burgundy is himself the Armed Man and “that it was after 1458 that Dufay presented him with six manuscripts of his work, possibly including this work”. Other commentators have declared that the work could well date, stylistically even, from the last years of Dufay’s life. As in their previous discs of Dufay’ songs (for example Glossa GCDP31903) and fifteenth century music in general Cantica Symphonia use instrumentalists: harp, organ, fiddle, slide trumpet and sackbut. There are seven singers employed. This goes against the recent, mainly British practice of conceiving these works as for a capella forces. Examples include the very compelling recordings of the ‘L’homme Armé’ mass by Oxford Camerata (Naxos 8.553087) and the ‘Se la face ay pale’ by the Binchois Consort (Hyperion CDA67715). Neither type of performance is totally satisfactory musically or academically. There is clear evidence that the Savoy Chapel employed instrumentalists, for example a trombone and an organ. Cantica Symphonia uses, very effectively, the slide trumpet to sound out the ‘L’homme’ armé melody where it firmly emerges towards the end of the Creed and later, decisively, in the Agnus. They double the voices with the harp pleasingly colouring the top part on occasions. They also allow the instruments to play alone, when in the manuscript no text is offered, to a long series of melismas. On some occasions, especially the more sensitive moments of the text, the instruments drop out completely. This adds much interest and dynamic variety. British singers, especially those from Oxbridge are more than used to singing unaccompanied and with such pure intonation that instruments, especially doubling ones, become a nuisance. On the Continent, with little of this tradition, using instruments is more common. Paul van Nevel does so in his many recordings and most effectively. If you prefer the thought of the Oxford Camerata — who give incidentally a generally broader reading than Cantica Symphonia — then it's worth bearing in mind that they use women on the upper lines. They put the mass into a more liturgical context surrounded by plainchant and a closing motet. The Binchois Ensemble is all-male and the mass is divided up with some plainsong and also a few motets. They are also less measured than Cantica Symphonia, knocking five minutes off the overall length. I love all of these approaches with a slight preference for the drama produced by adding instruments. This is an astonishingly well-filled disc and so it’s probably best to keep versions of all sorts if you have the space and enjoy the differences between what amounts to a British approach and a Continental one.